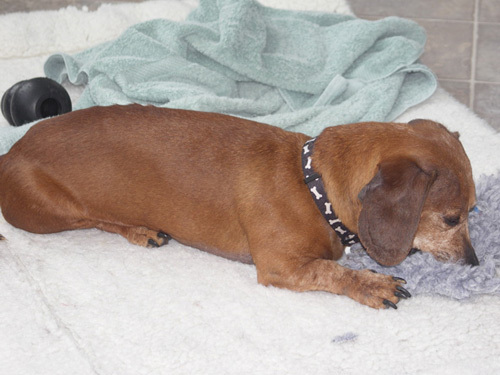 A Deputy County Attorney in Great Falls, Montana called us about a handicapped miniature Dachshund named Bailey who was caught up in a court case. Bailey was one of more than 100 dogs found at an animal hoarder’s property. Two years earlier, a veterinarian had treated Bailey for disk problems, but the surgery didn’t work. Bailey sometimes fish-tailed’ when he walked. Other times his rear legs would cycle rapidly, leaving him hopping in place. If he turned too fast, his hindquarters would collapse. Bailey’s owner decided she didn’t want to deal with him any longer. She handed Bailey off to… the animal hoarder. Fast-forward two years. The County Attorney’s office asked the same vet to evaluate the dogs at the animal hoarder’s property. 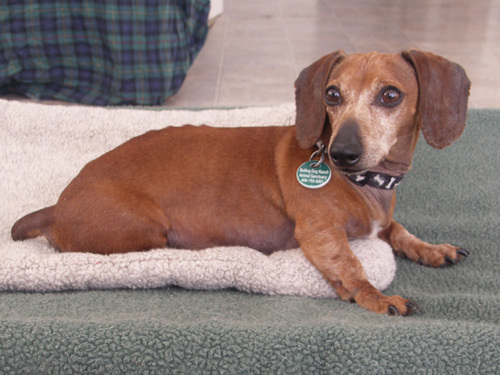 There, hiding in the corner of a pen with 15 other dogs, was a miniature Dachshund with a damaged spine. The other dogs were running over him and falling on top of him. So we expected a sad little thing to arrive at the ranch but instead we got an 11-pound bundle of spirit and playful energy. On his first trip outside to pee, Bailey promptly took off down the drive, relishing his new freedom. He scampered as fast as his little legs would take him, fish-tailing as he went, but astonishing us with his speed. 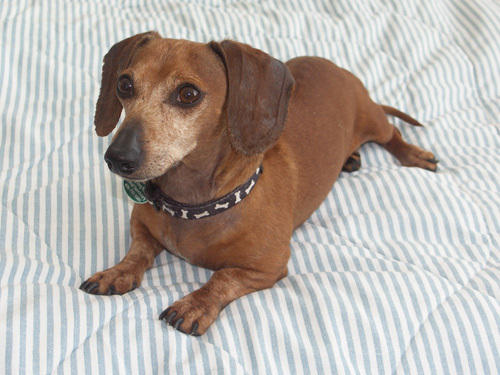 We took him to a specialist in Missoula for an exam and also consulted with our board-certified veterinary surgeon in Spokane, Washington. The conclusion: Any more surgery would not be an option for Bailey. 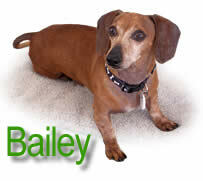 Generally there’s a maximum 2-month window in which surgery can be done on disk problems, and Bailey was long past it. Since the first round of surgery hadn’t succeeded, it was a moot point anyway. The important thing is that Bailey does not seem to us to be in any pain, and our specialist detected no sign of it either during his exam. Today this plucky little survivor lounges all day on a bed in our living room, and at night he sleeps in front of the wood stove. And oh, how Bailey loves his toys! He’ll grab a soft toy with his mouth, toss it into the air, then hop over to retrieve it and toss it again.